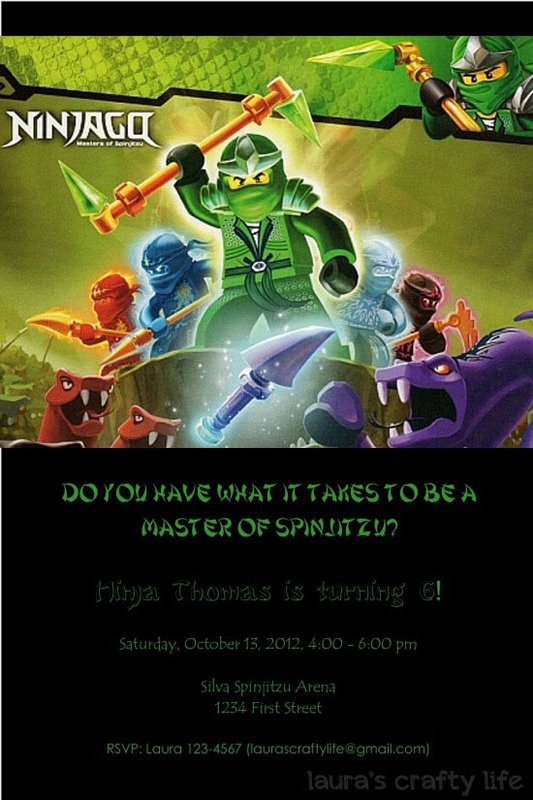 For my son’s sixth birthday he requested a Lego Ninjago party. Legos are big around our house and Ninjago sets are his favorite. 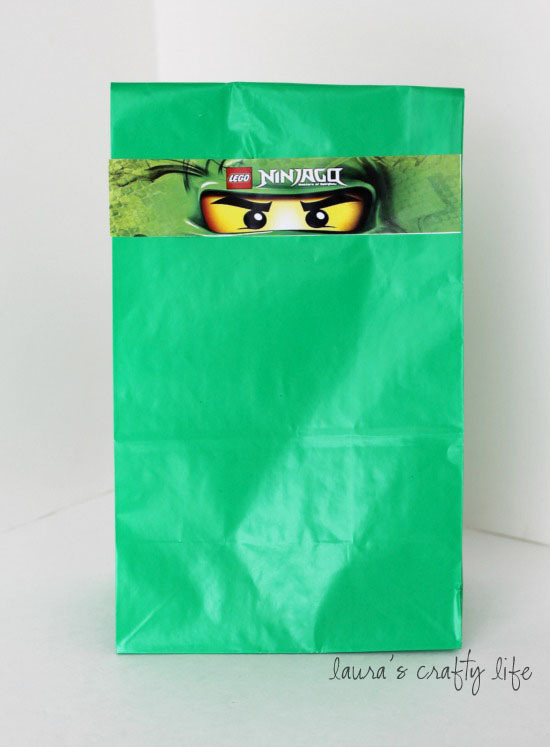 During last year the green ninja was revealed. Apparently he is the best one with the most powers. 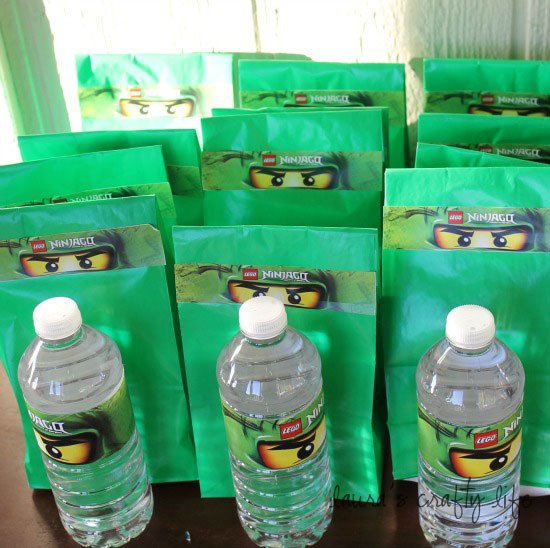 So, not only were we going to have a Ninjago party, it was going to be a green ninja party. 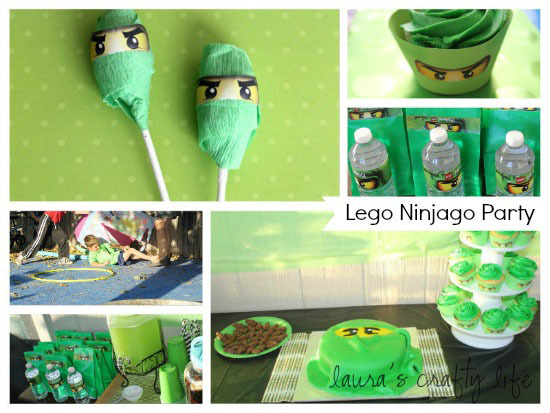 I started off preparing for this party by printing out my party planner printable and creating a Lego Ninjago board on Pinterest. These are always my first steps when planning any party for my kids. The first thing I created for this party was an invitation. Using My Memories, I created this invitation from images I found on the internet. From there, I started to plan what decorations we would need for the party. The color theme was going to be green and black, so I went from there. One of the challenges I have faced when planning the last few birthday parties is that our themes are not ones that you can just purchase items for. Parties can be much easier when you can just buy invitations, tablecloths, plates, banners, etc. from a retail store. So, I have to get creative to make our parties special. 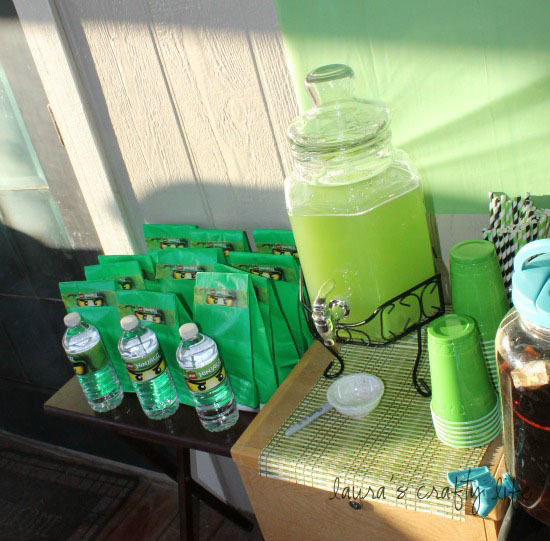 One of the ways I accomplished this for our party was creating labels for the water bottles on the table. This was an easy way to add in the theme on an item we would have had at the party anyway. It didn’t take much time at all! To decorate the table, I used a black plastic tablecloth. I also hung a tablecloth behind the main food table to tie everything together. I found some fun green and black bamboo like placemats that I used on the drink table and under the cake on the food table. I used my standard punch for this party. Add equal parts lemon lime soda, pineapple juice and your flavor of choice of Hawaiian Punch. We had a few games and activities for the kids to participate in. 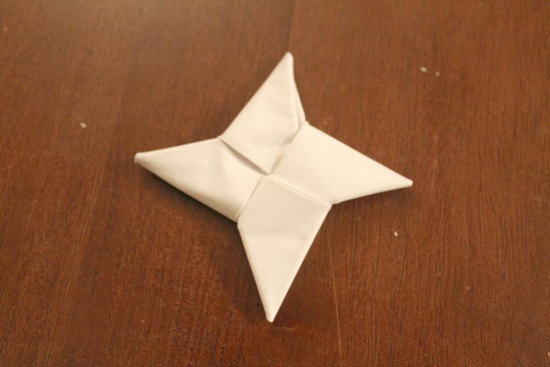 My husband helped me out by pre-making a bunch of ninja throwing stars out of paper. (Thank goodness to him – for some reason, I could not get the hang of this!) 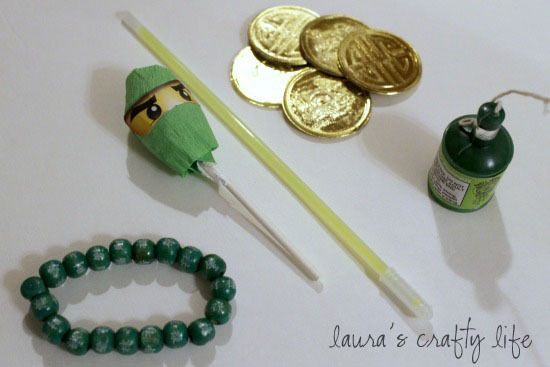 The kids were able to decorate their ninja stars when they arrived to the party. 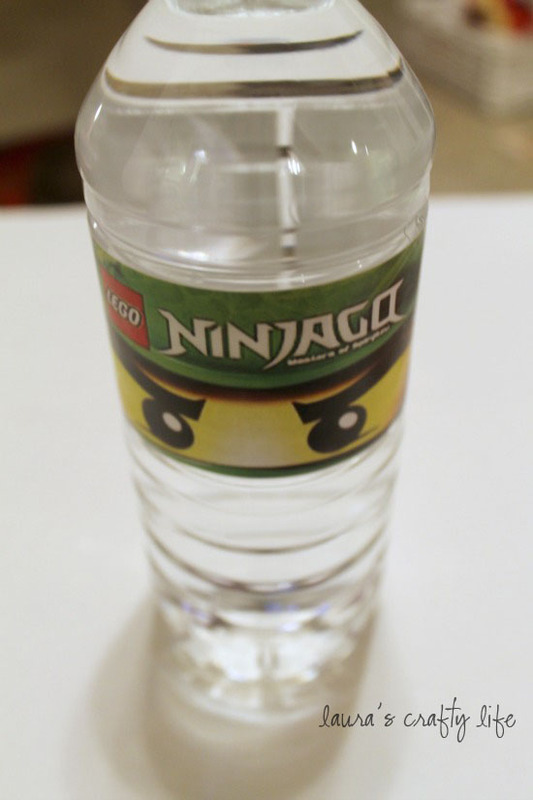 I also printed out some Ninjago coloring pages for the kids to color. Each child got a head band as well. I created these using a green knit fabric and cutting them into strips. Once everyone had decorated their ninja stars and were suited up, we played a fun balloon pop game. I used a black foam core board I purchased from Dollar Tree. 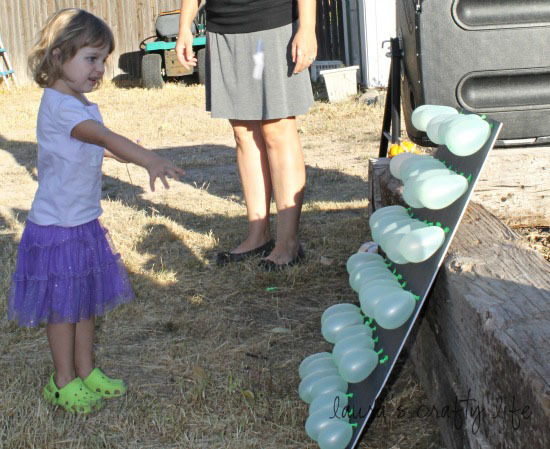 We had left over small green water balloons left over from summer. I blew these up and used straight pins to pin them to the board. Each child had a turn throwing their ninja stars to try to pop the balloons. It was harder than I anticipated, and soon each child was just going up to the board and popping a balloon with the star. 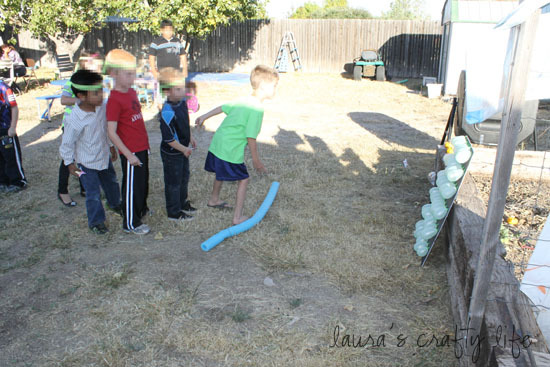 After the kids were done with the balloon pop game, we set up an obstacle course in the back yard. 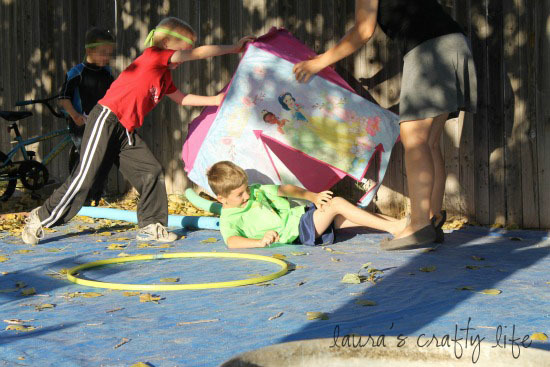 The kids had to hop down the length of the pool noodles, crawl through the pop up princess tent (I know it wasn’t part of the theme, but we used what we had! ), jump into the hula hoop, hula with the hoop and then throw their star into the metal bucket. The kids had a blast with this, and it took about 2 minutes to set up! Win, win! Then, we ate some delicious food. I tried to stick with an Asian theme for the food. We had this really delicious pulled pork sandwiches with homemade coleslaw. I didn’t get a good picture of the food table before the food was almost gone – I guess that means it was a hit. After the food, came the cake. 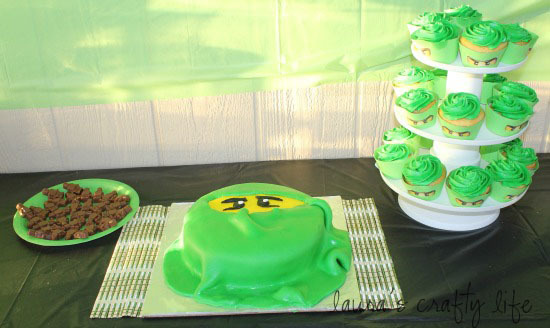 I posted about how I made the Ninjago cupcake liners and the fondant Ninjago cake. I think they both turned out really cute. 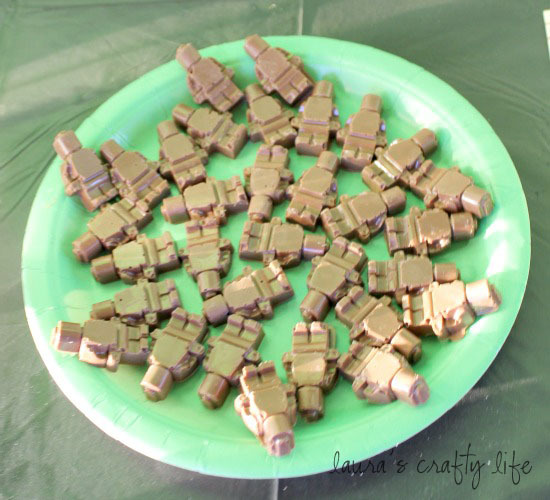 We also had candy Lego minifigures as a sweet treat. I purchased the mold from Amazon. My son loves to make ninja ice all the time, so this was a good investment! 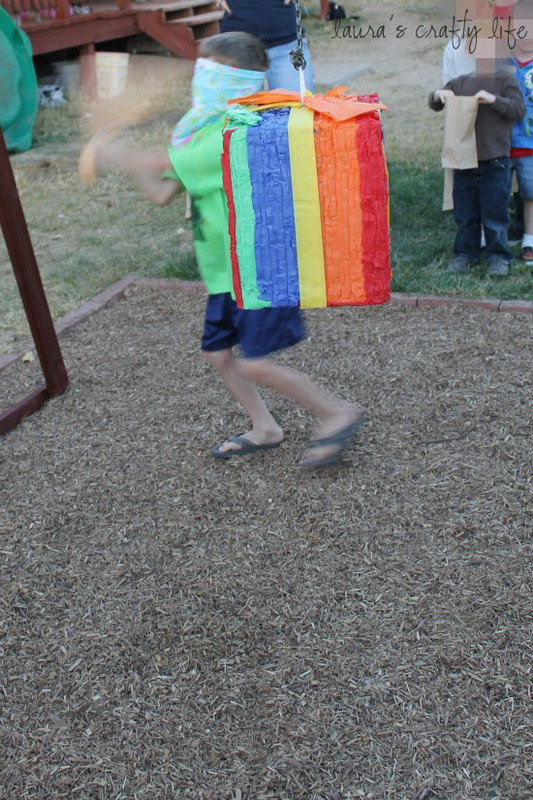 After the food we did the pinata. I waited to long to try to get anything online. I was having trouble finding anything that would fit within our party theme. 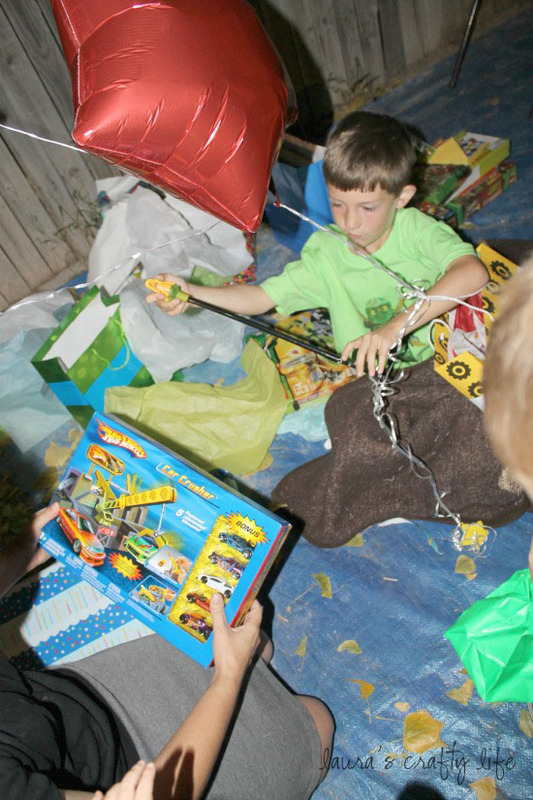 I ended up getting this generic present shaped pinata from Walmart a few days before the party. 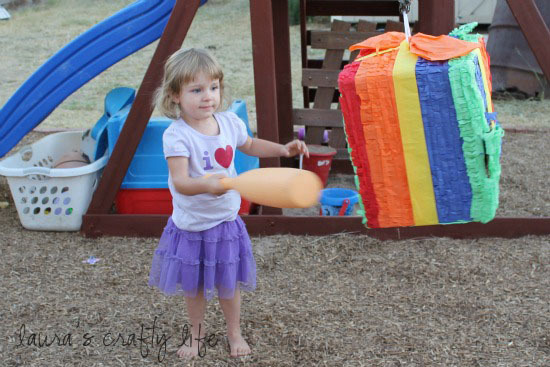 Tip: If doing a pinata – pass out bags ahead of time and write each child’s name on the bag. This helps avoid confusion and chaos after the candy drops. I also try to help the younger kids to be sure they have a chance to get at least a little bit of the candy. After that, we had a chance to open presents. My son got a TON of new Lego sets. We were really busy putting together Legos for days after his party. I made some fun treat bags for the kids to take home with them after the party. 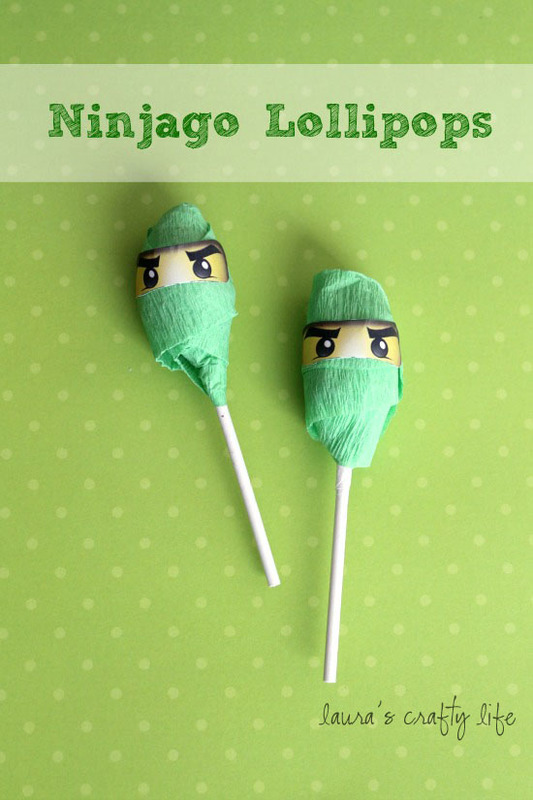 In an earlier post, I showed how I made the Lego Ninjago lollipops. They turned out really cute, I think. So tell me, do you go all out for birthdays or do you keep it simple? 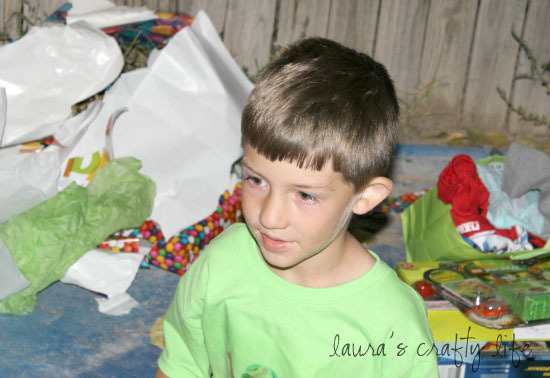 I actually love party planning, but I am thinking this next birthday party, we may do it at a local pizza place. Only time will tell! You’re welcome! Thanks for stopping by Kristi!